Competition for places is fierce at Barcelona, and reports claim Aleix Vidal could be set for an exit after failing to establish himself in Ernesto Valverde’s side. 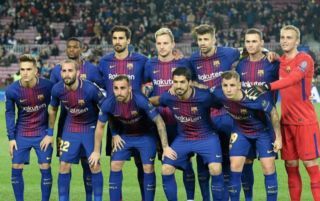 Despite the fact that the Catalan giants were competing on various fronts last season, the 28-year-old was limited to just 25 appearances in all competitions, with many of those coming off the bench. In turn, from the player’s perspective, it’s easy to see why he may want to seek an exit in order to secure a more prominent role elsewhere. According to Calciomercato, either Inter or Roma could be willing to provide him with that, as they’ve both been linked with a swoop this summer, with the latter tipped to perhaps be in a stronger position currently with Vidal’s agent said to have been seen in Milan. Further, it’s suggested that an offer of a loan deal with an option to buy clause worth €10m could be put forward, as Luciano Spalletti looks to add key depth to his squad this summer. After qualifying for the Champions League in dramatic fashion at the end of last season with their last-day victory over Lazio, Inter will need to strengthen their group in order to cope with another battle for a top-four Serie A finish and their European exploits. They’ve already landed the impressive signing of Radja Nainggolan from Roma, as per Sky Sports, but the report above would suggest that their recruitment drive isn’t done yet. Vidal joined Barcelona from Sevilla in 2015, but has gone on to make just 51 appearances for the club since. Nevertheless, he does offer versatility down the right flank along with a winning pedigree given his success at the Nou Camp. Further, after seeing Joao Cancelo’s loan spell end, with the Portuguese ace since signing for Juventus, as per BBC Sport, Inter are short of an option in that department and Vidal could emerge as the solution.